Campervan & Motorhome Hire Melbourne - Campervan Hire Deals in Melbourne! Melbourne is the perfect place to kick-start the motorhome holiday of a life time. Iconic roads, dramatic landscapes and quiet coastal coves are what you can expect on your travels in the surrounding regions of Melbourne. Discovery Campervans has you covered when it comes to finding the perfect vehicle for your Melbourne motorhome holiday, use our search box above to browse and compare vehicles from the top 12 suppliers in Melbourne including Britz, Maui, Mighty and LetsGo. Order and refine your campervan rental results by price, popularity and size using our advanced search tools. Tips: Look out for ‘Long Hire Discounts’ and vehicles that have a running special or promotion to save even more on your campervan rental from Melbourne! It is usually the small comforts that make a big difference when you are spending a lot of time on the road, don’t forget to include any additional extras to your motorhome rental from Melbourne such as baby seats, camp chairs, camp tables & more. Melbourne is great location to start your campervan hire holiday. Boasting a close proximity to some of Australia's greatest driving routes, a wealth of city attractions and a thriving and inviting cultural atmosphere. In the heart of Melbourne, visit the lush Royal Botanic Gardens, popular for a quick lunch or stroll. Federation Square is a meeting place which has become a well known landmark within the city, and Brunswick Street is known for its eclectic cafes, shops and atmosphere. Venture outside of Melbourne and you will find places like Philip Island, which offers a rare opportunity to see fairy penguins at play. The Grampians are just three hours drive west of Melbourne, and are especially stunning in spring when almost 1000 species of flower are blooming. Take your Melbourne campervan rental down to St Kilda where thousands flock to the beach here throughout summer. However, the best part about Melbourne is without a doubt its short distance from the famous Great Ocean Road. 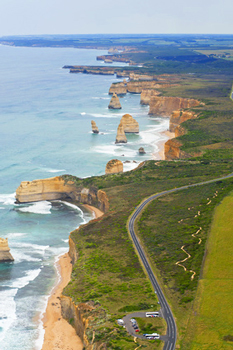 A unique Australian treasure, the Great Ocean Road offers travellers one of the most spectacular coastal drives in the world. It is the perfect destination for the self drive campervan hire holiday, with pristine camping grounds throughout the coastline, amazing national parks and pretty seaside towns from start to finish, there is something for everyone here. Apollo Bay is a great place to stop along the way. Situated by Cape Otway, about 190 kilometres from central Melbourne, it is extremely popular amongst the city folk as a weekend getaway. Known by many as 'Paradise by the Sea', Apollo Bay is built on a perfect semi circle beach with pristine white sands and azure blue water which helps justify this label. It is places like these that make Melbourne such a desirable place to visit while on a campervan holiday in Australia. Compare campervans by using the Quote Box above or contact us directly to find out more about campervan hire in Melbourne.